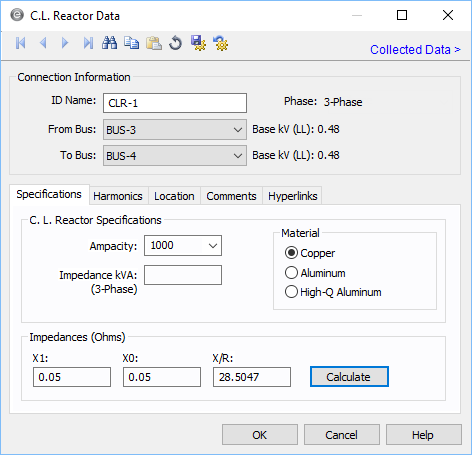 For current limiting reactors, the program automatically assigns the names CLR-1, CLR-2, CLR-3, and so on. The bus to which the equipment connects, which must already exist on the one-line. For your reference, the To Bus base kV is displayed next to the bus name. You must be careful that the To Bus has the same base kV as the From Bus. This field provides a list of industry standard reactor ampere ratings, but you can also type in a rating which is not listed. 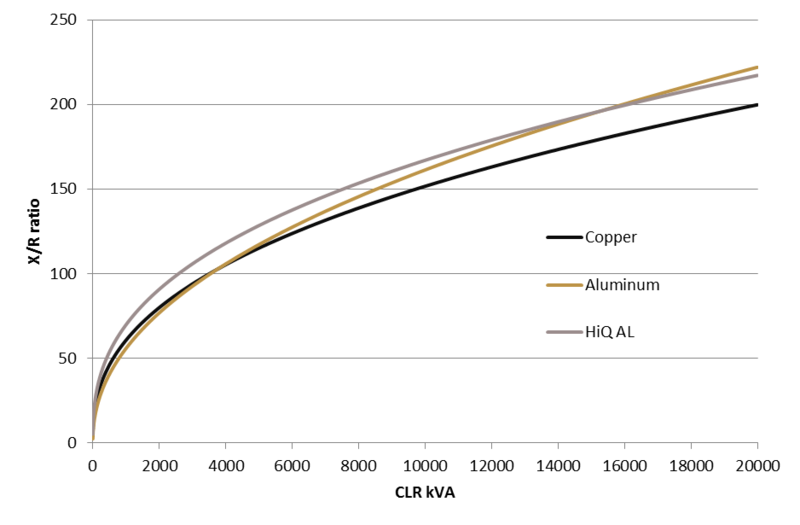 Reactor material (copper, aluminum, or high-Q aluminum). This value is used to determine the X/R ratio of the reactor. X1 Positive sequence impedance. When filled in with the Calculate button, this field’s value is based on the reactor impedance kVA. X0 Zero sequence impedance. When filled in with the Calculate button, this field’s value is considered the same as the positive sequence impedance X1. If you enter this value as zero (0.0), the positive sequence impedance is used. X/R Ratio The reactance to resistance ratio of the reactor. When filled in with the Calculate button, this field’s value is based on the impedance kVA and the material type of the reactor. Calculate Fills in computed values for the X1, X0, and X/R fields. You can override these values by typing in different numbers.